Our finest mixture of premium quality varieties brings colour and fragrance to your home and garden. Pick armfuls of bright, fragrant stems every day throughout summer. Richly fragrant Sweet Peas go together with warm summer days no wonder they are the nations favourite annual flower! This unique selection of scent laden kinds, made after testing more than a hundred varieties, rank among the most fragrant of all. With at least one fresh flower per plant per day at the height of summer, you’ll get hundreds every week. Our finest mixture of premium quality varieties brings colour and fragrance to your home and garden. Pick armfuls of bright, fragrant stems every day throughout summer. Sow in pots or directly in the soil until early May. 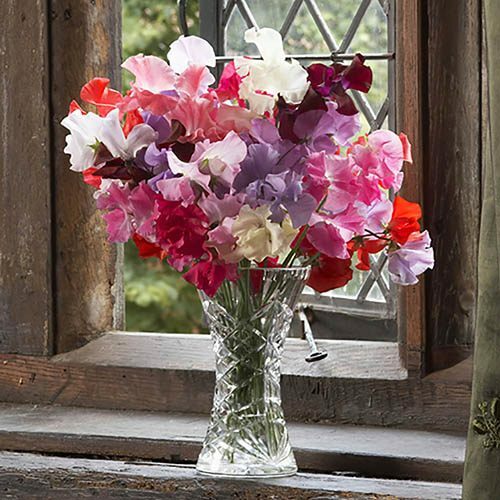 Richly fragrant Sweet Peas go together with warm summer days no wonder they are the nations favourite annual flower! This unique selection of scent laden kinds, made after testing more than a hundred varieties, rank among the most fragrant of all. You’ll get well loved, wavy Spencers and colourful grandifloras and the blend includes High Scent and Matucana, already renowned for their unsurpassable perfume. With at least one fresh flower per plant per day at the height of summer, you’ll get hundreds every week. Supplied as a pack of 100 seeds ready to sow between February and May. Sow in pots or directly in the soil.